It’s come to the point where no calendar year is complete unless I’ve decided to take part is some gruelling physical challenge that raises money for a sustainable cause. One of my best friends in London, a Palestinian-Libyan film-maker Tamara Ben Halim co-founded an initiative known as Cycling4Gaza. Cycling4Gaza is an independent, youth-led initiative that was founded by 4 humanitarians in the wake of the war on Gaza in 2009. What started off as a one-off cycle from London to Paris turned into a yearly international group event that aims to cycle ultimately into Gaza. This year’s challenge, held in October, begins in Olympia and finishes in Athens (a painful 350km later) bringing together 45 cyclists from all over the world. There are 9 cyclists from the UAE; we’re all amateurs but our spirits are high and we’ve been pooling our efforts to fund-raise in the most creative ways possible. The goals of this challenge are to raise more awareness about the ongoing situation in Gaza while raising funds for The Welfare Association, a non-political, non-religious, non-governmental British charity that provides education, physical and mental rehabilitation programs to the most vulnerable of Palestinians. The Welfare Association works with partner NGO’s in Gaza – we are raising funds for 3 NGO’s – The National Society for Rehabilitation in Khan Younis and Rafah, Society for the Care of the Handicapped in the Gaza Strip (SCHGS): “Club for Disabled Children for Educational and Social Support” in Gaza City and Nour El-Marrifa Association, Friendly Learning Spaces in the Middle Area. I was doing some statisical research on education in Gaza over the past few days, and the results were striking. The drop-out rates for males and females were essentially nil, and the literacy rate is over 90%. Even though unemployment is quite high, Gazans continue to educate themselves, which can only mean one thing – that they still maintain hope. These statistics prove that education should be continuously and heavily invested in in those areas. Other than attending spinning classes like maniacs and investing in padded spandex shorts. We will be hosting fund-raising events in Abu Dhabi and Dubai in the lead up to the cycle. We will be selling items at the Dubai Flea Market this Saturday. Feel free to come down and say hello, alternatively if you have junk items you’d like to donate before Saturday, I’d be happy to pick it up. We’re aiming to raise AED 10,000 this weekend. Like our Facebook Page for more information on the cause and our initiatives, or follow us on twitter @cycling4gaza. Alternatively if you’re feeling super generous donate on our Justigiving page. In the summer of 2009, I signed up with one of i-to-i’s programs to build a greenhouse in one of the most remote Himalayan regions, Spiti. For two weeks, my friend and traveling companion Ismat worked alongside Spiti Ecosphere, an incredible organization changing the lives of Spitians in the most sustainable ways. Spitians are relatively malnourished as they don’t have access to fresh vegetables and fruits during the winter months. This is mostly due to the fact that the roads to Spiti from Kullu are blocked during the winter due to heavy snow. Imported food is also incredibly expensive. Spiti Ecosphere partnered up with architects worldwide and have been building greenhouses in the Spiti region for the past few years so that the locals have access to fresh food year-round. 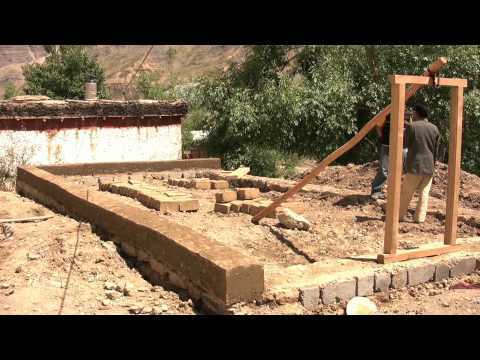 We lived in a Buddhist monastery in Pin Valley and built the greenhouse primarily for them. Read Ismat’s account of our experiences here.